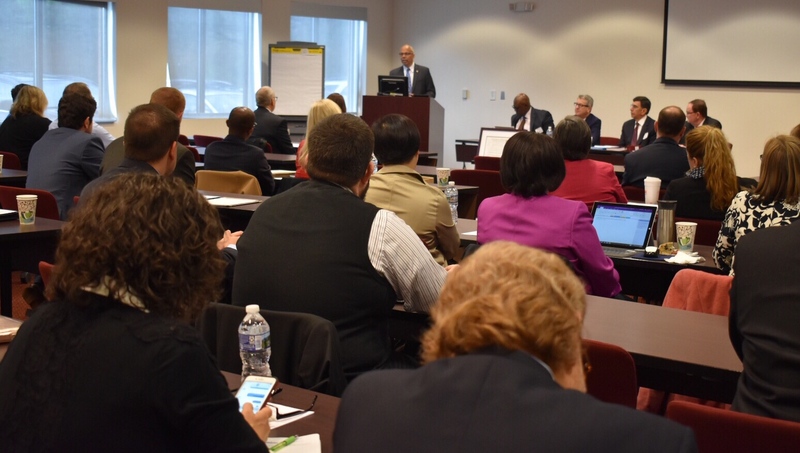 Maryland Lieutenant Governor Boyd K. Rutherford talked procurement reform and modernization during his opening remarks at a joint presentation by the MSBA Construction Law and Administrative Law Sections on April 17 at the Judicial Education and Conference Center in Annapolis. The program, “Bid Protests with the State of Maryland”, drew close to 50 people. “The program presented the opportunity for participants to hear firsthand from the Lieutenant Governor on the work of the Procurement Commission that he chaired, to meet and speak with the chairperson of the Maryland State Board of Contract Appeals, and to hear and exchange views with a few of the leading practitioners in procurement law in Baltimore City and the State,” says Robert F. Dashiell, of the Construction Law Section Council, who served as program moderator. Event sponsors also included Veritext Legal Solutions.